Walking as a need for life and a proposal for sustainable tourism. The second edition of the Trekking Fest organized by the Pro Loco Due Golfi begins Saturday, June 2, 2018. 12 dates during the summer and autumn weekends, dedicated to sport and wellness. “Art and Lemon” – Guided hike through the art of majolica and lemon cultivation. Visit to the S.S. Monastery Rosario of Monticchio and the “La Lobra” Agricultural Company in S. Francesco. Returning Pasta Party at the Parco Girasole, in Pastena. “Walk in history” – Guided excursion to the ancient Civitas, with final stop at the Parco Girasole, relaxing breathing exercises by the naturopath Elisabetta Rubertelli – gastronomic tastings. “Athena Trail” – Guided excursion along the Via Minerva. Km 7,5 – medium difficulty – difference in height 450 m.
Transfer by cableway to Monte Faito from where the excursion begins for S. Michele – Neviere – Secular beeches – return by cableway to Castellammare di Stabia. 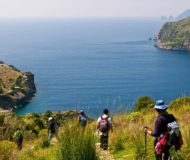 Excursion to Massa Centro, visit to the Center of the Protected Marine Area of Punta della Campanella – continuation to Marina della Lobra – free lunch – embarkation for sea excursion – disembarkation and return by bus to Sant’Agata. Guided excursion to the picturesque Crapolla Fjord.